Changing from conventional to solar lighting isn’t easy, but the reasons for you to do it are plenty, from not having to pay anyone else for the electricity once you installed your solar system, to the ones where you protect the environment. In order to go from conventional to solar, you also need to sit down and write the numbers, which is to make an idea about how much solar power you’d need for your house. Most of the photovoltaic solar panels out there are only 10% efficient, meaning that they’re able to convert about 10% of the solar energy they collect to electrical energy. You do need sun for the solar panels to work, you do need batteries to store that energy and there are plenty of good options out there. Keep in mind that power and energy aren’t the same thing. Power relates to how fast you’re using the stored energy, therefore power is a rate about how fast you’re getting or distributing the energy. Different light bulbs have various power needs so you do need to make the math for all the types of light bulbs, from the high-voltage metal-halide fixture to the little LED flashlight bulbs around your house. In order to light up a 100-watt bulb for three nights, you need to generate around 1600 watt-hours with one sunny day. But we can’t compare a sunny day from Massachusetts in December with a sunny day in New Mexico in august. Thanks to the National Renewable Energy Laboratory wrote down the numbers for so many years now, giving us the “Redbook” with all the data you need. This book includes the information for each month and each location in just one number. The number tells you about the equivalent hours of full sun for one day. For instance, an average day in Albuquerque in July gives 6.9 hours of full sun, whereas an average day in Boston in December gives around 2.9 hours of full sun. When you have a full sun, the solar power is about 1000 watts per sq.m. Therefore, in December in Boston you get 2,900 watt-hours per sq.m per day, whereas the numbers for Albuquerque in July are 6,900 watt-hours per sq.m per day. Considering the solar panel is 10% efficient, it means that each sq.m gives you 290 watt-hours in Boston in winter and 690 watt-hours in Albuquerque in July. For three nights, you need 1600 watts for your bulb, this giving you 1,600/290-5.5 sq.m in Massachusetts in December and 2.3sq.m in New Mexico in July. In the end, you need less than 1 sq., of solar panel in the New England for the winter and less than a third of sq.m in Southwest for the summer time. 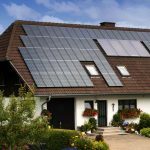 If you want to go solar, you may go two ways: you may connect the light to a solar-powered battery system, or you may remove the light altogether and replace it with a stand-alone solar fixture. Even though the first option is a bit pricier, it’s the best choice if you like your fixture and only want to convert some lights. This isn’t a conversion per say, even though you’re replacing the electric light with a stand-alone solar light. Solar light fixtures are quite cheap and pretty easy to install too. They get the energy from the photovoltaic panel and in many cases they’re attached to the fixture. You may also find kits that contain fixtures, panels and wire that link all of them. When you’re getting a kit like this, you get the chance of placing the panel in a sunny location and install the fixture exactly where you need it, even if it’s a shady place. There are many good things that standalone fixtures bring to the table, but you also have to take into consideration the downsides. The main flaw is that they’re not as bright as electric lights and, furthermore, they do grow dimmer during the night as the charge in the batteries goes away. 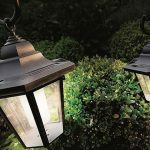 They are a great option for the early part of the night though, offering you enough light for some walkway or garden. It’s not impossible to convert some outdoor light fixture into solar, but you do need some system elements, apart from the solar panels that are giving you the power. Now that you’re on it, you may want to change the incandescent bulb with some LED bulb. LEDs do give a good amount of illumination, using a fraction of electricity. That is if we don’t count the fact they don’t overheat (like the incandescent ones), taking the use for a very long time. It’s best to start with your battery bank and knowing its size is going to tell you about how much output you need from the solar panels. Get at least one deep cell battery for your lights and go for one rated for at least 150amp hours so that the system isn’t affected by the cloudy days. It has to be strong enough to power the inverter too. You want your battery to holds its charge for long time if you want your lights to run for many hours. But, the bigger the battery, the bigger the solar panel has to be too. most solar panels out there give a 5watts output for a battery, but the large the panel, the faster the battery is going to charge, and that’s important to know. For a 150Ah battery and 8 hours of sunlight in a day, your solar panel should be at least 120 watts so that the battery fully charges throughout the day. You may go with just one 120-watt panel, but you may also combine identical smaller panels wired in series. the inverter is supposed to convert 12-volt DC power to 120-volt AC. It’s not impossible to wire your existing light straight to the inverter and a 600-watt inverter is able to give you enough power for your light, with minimal risk for draining your battery. Having a charge controller isn’t mandatory, but you may want to play it on the safe side and get one. It’s a useful device that protects the battery from overcharging as you connect it between the panels and the battery. In order to expand the lifespan and to keep the solar panel efficient, you may want to protect it from the elements and put it in an enclosure (a shed does the trick). On the other hand, you do want the solar panels placed so that they get the highest amount of sun throughout the day. Once you installed the panels, you connect them to the charge controller that you want it close to the battery. You need to use a low-voltage wire. You go on with linking the charge controller to the battery with the battery cables. You finish with connecting the inverter to the battery cables, but keep in mind that the inverter also has to be close to the battery. Once all of these components are linked to each other, you get power and you only need to connect the light to the inverter. 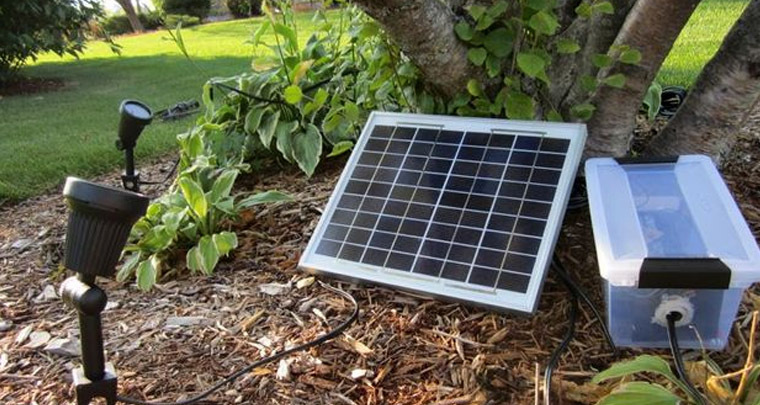 Most inverters out there come with receptacles, so the easiest way is to disconnect the light fixture from the electric panel, run an outdoor cable (12 or 14-gauge) from the light to the inverter, put one end to the light, install a plug on the other end and finish by plug it into the inverter. If you had a sunny day, the light should run bright all night long. We’re pretty sure you don’t want the light all day long, so you do need a switch for the light. You may operate the light manually, in which case you need a conventional switch, in a very easy to access place. You may run a cable (12 or 14 gauge) from the light to the switch, running a second length of outdoor cable from the switch to the inverter. You also need to install a plug on the wire between the switch and the inverter. When you want the lights to come automatically, you may plug a timer or light sensor into the inverter, plugging the lights into that. You may also have a light sensor, meaning you can’t place the inverter in a sunny place, but you may run a length of outdoor cable from the inverter to another safe place. You should install a female receptacle on one end of the cable and a male plug on the second end. Finish your project by plugging the cable into the inverter and plug the sensor into the female end of your cable.